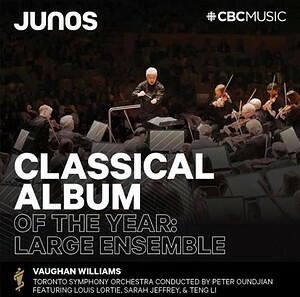 Vaughan Williams: Orchestral Works Featuring The Toronto Symphony Orchestra Receives JUNO Award | Lawrence Wiliford | Dispeker Artists, Inc.
As announced today by the Canadian Academy of Recording Arts and Sciences (CARAS) during the 48th annual JUNO Awards ceremony, the recording of Vaughan Williams: Orchestral Works featuring the Toronto Symphony Orchestra (TSO) received a JUNO Award in the Best Classical Album: Large Ensemble category. I'm absolutely thrilled to receive this tremendous honour, says Peter Oundjian. This recording of exquisite music by Vaughan Williams is the result of the dedication of many people to whom I'm deeply grateful. It's a wonderful collaboration of Canadian talent and it is inspiring for us all to be recognized in this way. We are deeply honoured to be in such remarkable company for this award, comments Matthew Loden, Chief Executive Officer. On behalf of the artists who are featured on this recording, I would like to thank conductor Peter Oundjian and Chandos Records for their incredible work. We also send our congratulations to the other exceptional nominees who truly represent the best of classical music in Canada and around the world. Released on the prestigious Chandos label in June 2018, this recording celebrates the Orchestra's renowned principal players, focusses on Canadian soloists and displays a passion for the music of Vaughan Williams. The TSO's latest album has been described as a rich, often deeply sensual musical treat from start to finish by the Toronto Star and a fine collection of mostly unjustly neglected pieces in first-class performances by some of our finest artists by Ludwig van Toronto. If you buy only one new Vaughan Williams album, make this all-Canadian-cast recording the one, added World magazine. Featuring TSO soloists Principal Viola Teng Li and Principal Oboe Sarah Jeffrey the recording also showcases Canadian pianist Louis Lortie, and singers Carla Huhtanen, Emily D'Angelo, Lawrence Wiliford, Tyler Duncan, and the Elmer Iseler Singers, all under the direction of conductor Peter Oundjian. The recording was captured during acclaimed live performances at Roy Thomson Hall in November 2017 by Soundmirror Inc. In December 2018, the album also received a nomination for a 61st annual GRAMMY Award in the Best Classical Compendium category. Vaughan Williams: Orchestral Works (CHAN5201) is available in stores across North America, as well as on iTunes and Apple Music. The recording is also available for streaming on Spotify and for purchase on TSO.CA. The Toronto Symphony Orchestra is generously supported by the Canada Council for the Arts, the Ontario Arts Council, and the City of Toronto.